With the one year anniversary of Steve Jobs passing coming up on October 5, I'm once again thinking about getting NeXT's OpenStep installed on my MacBook Pro. 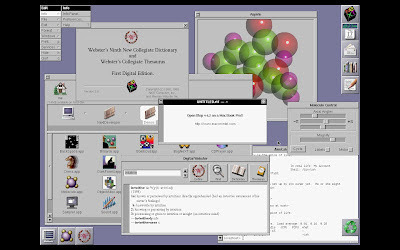 NeXT's operating system software, NextStep 3 and OpenStep 4 wouldn't be installed directly on my Mac hardware, but rather I'd install it as a guest OS in Parallels or Fusion. The problem, really, is that legal copies of NeXT's software is hard to come by and my knowledge of UNIX and Linux is painfully low. The Mac On Intel blog looks like a good place to get started. If I'm going to get this done by October 5, it's going to take a lot of long nights and help from the community. Can I do it? I don't know, but I'll give it a try. If you have some NeXT OpenStep experience running inside Parallels or Fusion, hit me up on Twitter with the handle @alanmgrassia.